My sister Deborah died early Friday, January 31st, just as the sky began to shift from black to gray in its prelude to sunrise. She died five years to the day she casually closed the door to the house she once loved and followed me to her car. Five years to the day we left California and flew to Vermont for a visit she didn’t know would be permanent. Frontotemporal degeneration stole Deborah’s ability to reason, to speak and, in the end, to swallow. She’d been a healthy weight until the part of her brain that controlled swallowing began to die, and there were times when no amount of coaxing and tempting could help Deborah’s food travel beyond her mouth and into her stomach. Her weight dropped, her body weakened. The last Monday in January, the Hospice nurse heard pneumonia in one of my sister’s lungs. By Tuesday, Deborah’s breathing was rapid and she was too weak to be helped out of bed. On Wednesday morning as I lay beside her, Library Lion propped on my knees so she could follow as I read, I didn’t realize it would be the last time Deborah would be able to respond to me. When I returned to Deborah’s room that afternoon, her eyes were half-closed. The morphine the doctor prescribed to ease the burden of breathing had taken my sister to an in-between place. I stayed the night with Deborah that Wednesday, holding her hand, listening to Elton John and Carole King. Talking. Remembering. When I ran out of things to say, I read aloud The Lion, the Witch, and the Wardrobe, one of our favorites growing up. And though my sister’s breathing was too shallow and quick, her heartbeat stayed strong. When Jill, her companion, came at 8:30 the next morning, I kissed Deborah good-bye. I drove back to a world where breakfasts were eaten and parades of school buses delivered kids to their friends and teachers. I showered and slept in a pool of sunlight. Eight hours later, I was with Deborah again. It had been six days since she’d eaten anything, six days since the Hospice nurse said my sister needed her strength for breathing, not swallowing. Deborah, propped on a nest of pillows, feathers of hair swept lovingly away from her face into a braid, was emaciated. Beanie babies Mickey and Minnie rested in the curl of her fragile fingers, fingers that a week before had clutched them to her chin as she slept. I read aloud The Magician’s Nephew, hoping Deborah was discovering her own version of Narnia as she slipped away from our world. I counted her breaths, 32 per minute jumping to 40 whenever a nurse had to shift her. Over three times faster than my own. Every two hours someone came in to check her, to squeeze morphine under her tongue a drip at a time. Between doses I warmed her hands, stroked her face, moistened her lips. Twice in the night I drifted to sleep for the better part of an hour, then jolted awake, pulse pounding until I saw Deborah’s chest rise. By five o’clock, her breathing had slowed to 18 breaths per minute. At 5:10, Deborah stopped breathing for one minute. Apnea, a nurse said when it had happened earlier in the night. I held my breath, too, until her chest rose again, her breathing quiet and even as if she’d never faltered. I told her I loved her. I told her I’d miss her and that she’d always be my big sister. I remembered how, early on in Deborah’s disease, she used to say she felt as though an alien had taken over her body, and she wanted it to give Deborah back. To let her be Deborah again. “Pretty soon you’ll be able to leave that alien behind,” I whispered as I laced my fingers through hers the way she insisted whenever we held hands. At 5:15, Deborah stopped breathing again. I stroked her arm and waited for her chest to rise, but the only movement I saw was the beat of her heart under the thin gown. Soldiering on. Until. It. Stopped. I stood watch over the shell my sister left behind, hardly able to fathom her silent passage from the living to the dead. I tried to focus on my hope that Deborah was whole again, no longer a shadow of her former self, but it was impossible not to cry over the vulnerable person my sister had become the last years of her life, impossible not to cry over the gaunt face that would never again flash a smile or gaze at me with childlike wonder. I still can’t bring myself to look at photographs taken of my sister after FTD began ravaging her brain. I can’t bear to see how helpless and dependent she became. I can’t bear to see the last timid smile caught on camera as Deborah modeled the new pajamas I’d pieced together into the romper-style she needed to wear. Soft plaid bottoms as fuzzy as a kitten, and cotton candy pink top. The same pajamas we dressed her in before they took her away. Deborah proud beside the rust bucket car she bought in grad school. Deborah elegant in a black evening gown and opera gloves for the Emmys. Deborah playful on a gingerbread house building-afternoon with my children. 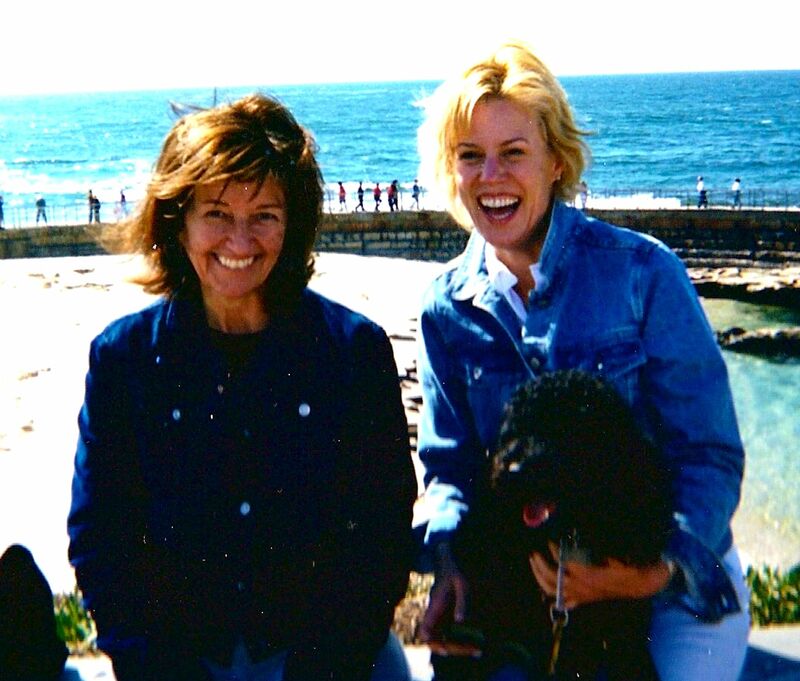 Deborah with her friend Phyllis on the beach—furry Satchmo held close—my sister’s smile radiating pure joy. The Deborah she once was. The Deborah I hope she is free to be again.